So, here we are. Another year over, and a hopeful start to the new year with resolutions, goals, and plans. The Downtown All Stars are back on track with 8 months or so to go for our campaign to raise funds for Little Kids Rock. We are getting creative with new ideas for marketing the CD and maybe some fun events in Spring and Summer. But, before we get to our plans – we’d like to express some thanks for good things that happened with some of our artists between our November 6, 2013 CD Party and today…..
His track “Calling 4 an Answer” which is on the Brights Lights on Broad Street CD, originated from the CD “My Introduction“. Gil has been back in the studio working on his second digital EP release. The second release currently in production follows his first digital EP “Where do we go from here“. A blend of rock with some David Bowie and Pink Floyd influenced textures. His upcoming spring 2014 release is tentatively title “My World” and will be a more tongue-in-check grovin themed release. Since the November 6, 2013 Release Party for the Red Bank All Stars, Belmar-based blues/groove/rock band Pepperwine has been busy in all facets of the music world – hours of practice spent breaking in a new drummer; hand making limited edition Pepperwine Swag (t-shirts and sweatshirts); hosting a belated CD release party for their five song EP “Mighty Fine”; and getting nominated for three Asbury Park Music Awards (best blues/soul band, best female vocals, best keyboardist). New Year’s Resolution: listen to more Pepperwine. Saturday, January 11, was officially Clarence Clemons Day in NJ. In honor of his late father, Nick Clemons held the 2nd Annual CCD Celebration/Big Man’s Fund Benefit, at Martell’s Tiki Bar in Point Pleasant, with this years event reuniting many of the Big Man’s West performers, including some from Clarence’s band The Red Rockers! 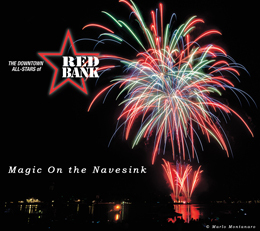 VyntEdge was honored to be included in the performance lineup, kicking off the festivities with a 20 min set of Bruce Springsteen songs, their original song, ‘Love Ya Anyway’ where they introduced the Red Bank All Stars CD. 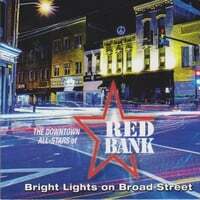 The artists who have so generously donated their music for our CD, Bright Lights on Broad Street, are doing some great things and we will be sharing a lot of that with all of you. The CD is still available for sale and download on our website! And remember that you can also donate without making a purchase. Thank you for your continued support, and don’t forget to share us with everyone you know, and keep the generosity flowing!